These were our first guns. They've been modified and improved since then, but as you can see they deliver splurge in all the right places! You can of course opt not to go totally bonkers in the final moments of the show, but it really is fantastic fun! 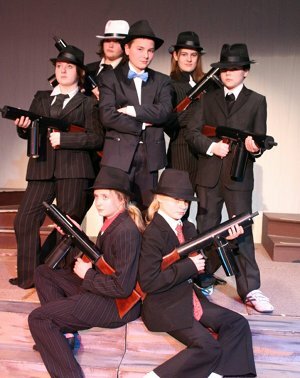 "The splurge guns were a fantastic addition to our production of Bugsy Malone. Our intention was to provide our talented school cast with the best platform possible to perform and these certainly helped us to do that. Right from their arrival at school, the week beforehand they caused great hysteria and fun and this was soon replicated by sell out audiences night after night. I cannot recommend them enough"
A box of 10 excellent, robust great looking guns and one backfiring gun for Knuckles that looks .. well, less professional shall we say! It's important that the gun Knuckles produces looks homemade and shoots him squarely in the face/chest when aiming in the opposite direction. The guns are easy to load and we'll give you printed instructions so you can't go wrong. We do advise you to have a designated splurge gun technician/monitor for loading & cleaning. Please don't let the cast reload their own guns - we've seen what happens & it's expensive. At the moment we only supply 6 cans in total for your hire (so 6 arrive loaded), but we will point you in the direction of a splurge supplier (long story!). Please note you can ONLY use Avalanche Spray in our guns - not silly string or anything else you may come across. PLEASE also note that there is a 'new' avalanche spray on the market and it does not work well in our guns (very thick), so please don't buy before speaking to us. 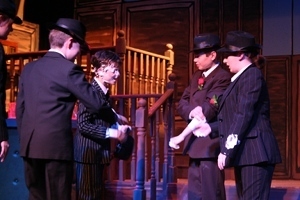 "Thank you SO much for your help with putting on Bugsy at The Downs School. 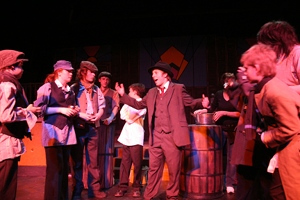 As I knew thy would be, the guns were an instant success with cast and audience alike. They really do make the difference between an good production and a splurgastically memorable one! Many thanks also for being so flexible with the costume hire. The girls (and indeed the boys) looked terrific." In our experience (and we didn't hold back as you can see) 30 cans should be enough for one rehearsal and 3 performances. Some people recommend a new can for each show, but that creates quite a lot of waste. If you have someone ready to reload when they run out you should be fine! You'll have to tackle this one! There's no getting away from it. Get a team of volunteers to form your cleaning squad and arm them with sponges and bowls of warm water. Splurge, if left to dry will stain fabrics. 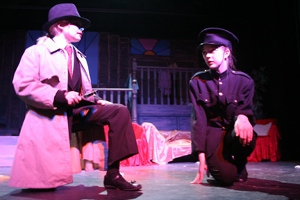 We recommend sponging any splurged costumes/hats off AS SOON AS THE CAST COME OFF STAGE - really! That way they'll look ok for the next show as well. When we get them back we'll clean thoroughly. For stage blacks/curtains etc the same applies. As soon as you can, get the splurge sponged off. 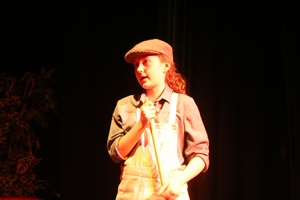 If the stage has splurge on it at any point (it will) I recommend using the characters of Fizzy and Joe the Barman to do a spot of cleaning on set in character during a scene that they're in! Worked for us.